Friday was a day of awesome hills. This 25.6 km run was set at the Chicopee Ski Club and the runners spent hours up and down the hills. My knees ached watching them. I have to admit that I have not even walked this route once. After that hard of a run, a super feeding of all participants was required. The chosen theme for the day was "Asian Cuisine". It was a challenge finding appropriate recipes. One suggestion was for me to find a 'noodle salad that includes bean sprouts'. Not as easy as it seems. I did check my Thai cookbook, but again re-confirmed my opinion that that book is great reading, but not good for cooking. Blogger seems to be having 'photo troubles' again so I'll add the pics later. I did find that recipe and am wondering why I haven't made it before. 'Spicy Noodle Salad' from Anne Lindsay's Light Kitchen. This is made with very thin pasta such as capellini, red pepper, bean sprouts and a light rice vinegar and soil and ginger root dressing. Was a very popular choice. In keeping with the theme I made 'Minty Pawpaw Salad' (Thailand) by Jean Pare's 'Company's Coming Asian Cooking. There are very few times I use papaya and this is one of them. Also includes thin slices of red onion, red pepper and mint leaves. Most dessert ideas I came across were more the idea of a pudding or involved cooked bananas that were to be served warm. I settled on 'Cherry Coconut Macaroons'. It made me think of the lichee fruit that is served at some Chinese buffets with cherries shoved in the opening. 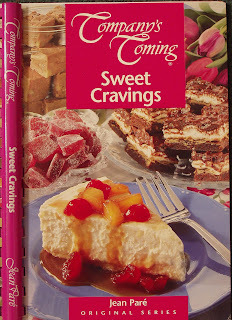 This recipe is by Jean Pare's 'Company's Coming Sweet Cravings'. To add a bit of fun to the dessert menu, I wanted to make those chocolate cookies with chow mien noodles and peanuts. 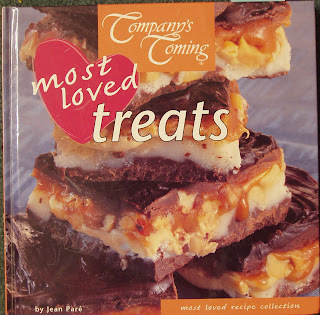 The recipe is called 'Noodle Power' and is by Jean Pare in her cookbook 'Company's Coming Most Loved Treats'. 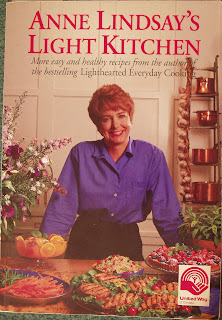 I love many of the very tempting recipes in this cook book. 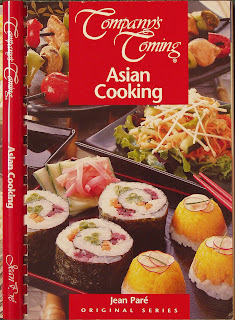 One shouldn't be allowed to put some many delicious recipes within one cover. I'm a day behind and still have to tell you about Saturday's run and BBQ dinner. That would be the carbo loading pasta feast in runner talk. I have my dishes made for Sunday after the completion of the marathon. I will be at the first water station along with my daughter. Gotta go as the race is starting at 7:30 am in an attempt to miss some of the heat. Wish the runners good luck. running, eating and books...well that pretty much covers all my interests! happy belated birthday! i had a b-day recently too, i spent it learning how to knit. Thanks for the birthday wishes. Next year my birthday will be same day as the pre-race get acquainted party.